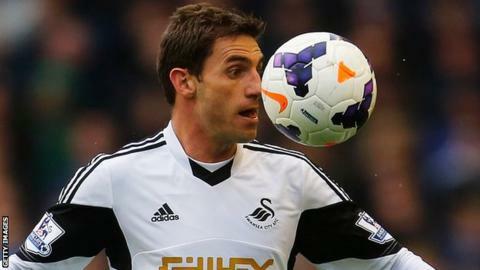 Spanish defender Angel Rangel has been ruled out of Swansea's last two games of the season by a groin injury. The 31-year-old sustained the injury during the second half of Saturday's 4-1 win over Aston Villa, which secured their Premier League status. After back-to-back victories, the Swans host Southampton on Saturday before ending their season at relegation-threatened Sunderland eight days later. "It would be fantastic to finish the season on a high," said Rangel. "Now we have the chance to make it three with another home game." Before the victory over Villa, which took them into 12th place on 39 points, Garry Monk's side won 2-1 at Newcastle. "It's been a really difficult season for us, but we have fought until the end," added Rangel. "It looked as though we might struggle, but with two wins we look like we could finish above 12th. "Our aim is to get more than 40 points and we have the chance to do that with six points to play for."